The Holbeton pre-school Beach School has added another dimension to what they offer children since the beginning of the January term. 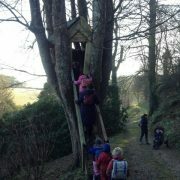 Now parents drop off their children at Mothecombe House at 9am, and the children meander through the lovely child -friendly gardens to the beach.Exploring the exciting tree-house beside the fairy tree, and marvelling at the prehistoric- looking giant plants by the pond is all part of the adventure. 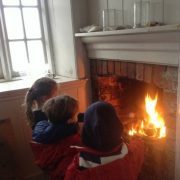 When the drizzle becomes a downpour, the children scamper into the little beach house to warm up and toast marshmallows on the fire. Nothing deters them from enjoying their regular day at the beach, and the teaching that is woven into their play just adds to their fun. No wonder mothers are driving from Totnes and Plymouth for their children’s early years education. The children have just as much fun on their Forest School day in Holbeton, after a short walk from Holbeton Village Hall car park down to the Flete Estate woods on the edge of the village. Construction of a fire pit and a new shelter will enable year-round outdoor teaching in the woods too. If they can teach outside through the winter in Finland, Devon’s weather is no challenge! And the great news for both the mums and children is that the Forest School is on the syllabus right through Holbeton Primary School.